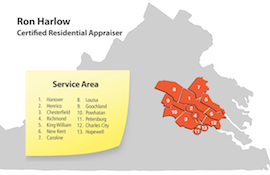 Hanover County is just north of Richmond and has a land area of 471 square miles. The population is just under 105,923 and the median home price is among the highest in Central Virginia. Hanover has many rural areas but is also highly populated, particularly near two interstate highways (I-295 and I-95), giving it a strong tax base.